Maine’s most successful comedian, behind perhaps Governor Paul LePage, is making a triumphant return to Orono to play one night only at the Collins Center on Friday October 4th; of course we are talking about Bob Marley. We broke the news of his newly announced show on our Twitter feed last week and needless to say a lot of you are getting excited for this event. What better way to introduce those out-of-state and international students to life in the Pine Tree State than with a performance by Maine’s comedic expert. Bob is a native of Bangor, Maine but spent his later youth growing up in Portland and attending Deering High School. He went on to enroll at UMaine Farmington which makes him an honorary member of Fill The Steins Nation in our book. In a career that has stretched over 15 years, Marley displays the experience of a road veteran while maintaining current and relevant content and observations. He has performed on virtually every late night talk show from Leno to Letterman as well as being featured on Comedy Central multiple times. You can purchase tickets for Marley’s performance at the Collins Center through his website or through the CCA box office page. 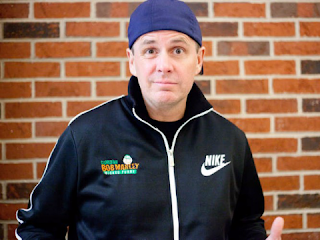 We hope to have an interview with Bob a little closer to his trip to Orono and we’re hoping for a sold out performance with one of the funniest guys we know.